Here is something you do not see as much in the Mazda stance game; Mazda 3 sedans. Especially ones that are stanced aggressively and have a nice flow to how they look with what they have accomplished. This is a 2006 Mazda 3 i sedan in Black Mica from New York. We had the chance to share this sedan with the rest of the community and got the honor of getting the car shot by Jess Kang, who happens to be the owner’s wonderful photographer girlfriend. Let’s see what this car is all about….. These are the every so famous and already going to be known as a classic wheel in the history of wheels; Enkei RPF1 in F1 Silver. 18 x 9.5 +15 in the front and 18 x 9.5 -5 in the rear. Yes, that is pretty aggressive for a sedan model to have, being that sedans have slightly smaller fenders compared to the hatch and the Mazdaspeed models. The most surprising thing is that this car is not on BC Racing coilovers like every other Mazda and car out there these days, which of course is not a bad thing at all. However, it is nice to go low on something no on else has gone low on. This is sitting on Yellowspeed Coilovers and SPC rear camber arms. As you can see the rear camber is set to -7 as seen in the pictures. You might think running so much camber especially in the rear is pretty outrageous, but that is totally up to what your trying to accomplish, and the look you want your car to be stanced towards. Other exterior items include s-model side skirts, OEM rear flares, s-model front lip, s-model grille, and custom backed headlights. As the interior pieces include wink mirror, quick release steering wheel, and harness bar. While, the power/engine modifications are minimal. The car is constantly being worked on and maintained. And as time goes on, more improvements will be made, such as re-done interior, shaved exterior, and of course a different setup. And recently the owner dented one of the wheels from driving the car around town. This has hilariously given him the opportunity to go wider. So we are hoping for more interesting things from this sedan from New York in the near future. Thank you for reading and hope you enjoyed the pictures. Special thank you to Kevin Ehm the owner of this sedan and Jess Kang for the photographer. Could not have done this feature without you guys. Love you both. First of all big props on the wide wheels and perfect fender pull. I would like to have that done to my hatch but i fail to find anyone good in central Ohio to do it. 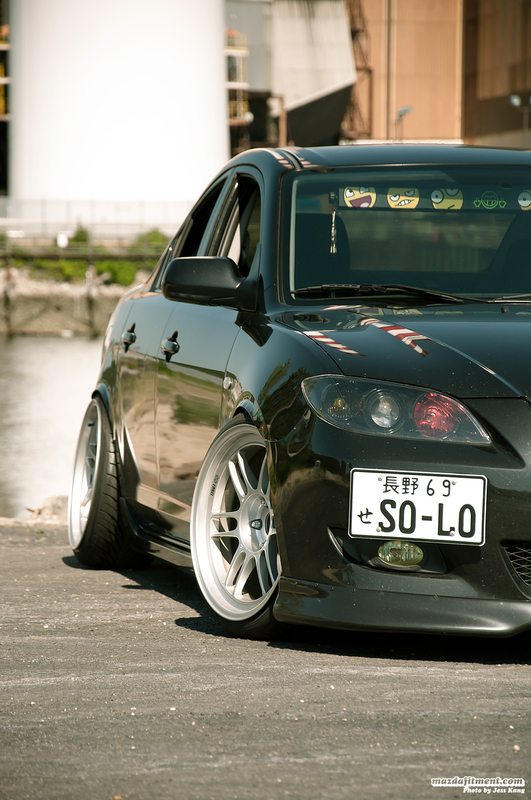 I am however looking for a good front lip and i really like that one. Unfortunately i have the hatch and i believe this s model wont fit. Do you know of a lip similar to fit an 05 hatchback. thanks and keep up the good work..